Protect Realty is committed to doing what's in our name, and our DNA. Dedicated to Protecting our clients, without any Conflicts of Interest. 100% Committed to the highest level of customer service and client satisfaction. Helping clients make the smartest real estate decisions given market conditions and their specific business requirements. Designing Creative Real Estate Solutions for every type of project and client. Focused on Representing the Tenant or end users of Space for Office, Industrial/Flex, Data Centers, manufacturing facilities, Historical Redevelopment projects, and adaptive re-use of properties. Get the Protection you deserve with our Proprietary Lease Administration Services. Our FREE lease review comes with a market analysis and lease abstract with real time lease tracking. Never miss a critical date, and get notifications delivered to your inbox when there is a change at your building, in the market, or for any specific lease requirements. RESULTS MATTER. CLIENT SATISFACTION GUARANTEED. Racine, WI. Transforming a Classic 3 story Timber loft Industrial building originally built in 1890 and converting it into a modern Residential Apartment building. Existing Photo of 1701 Packard Ave. in Racine. 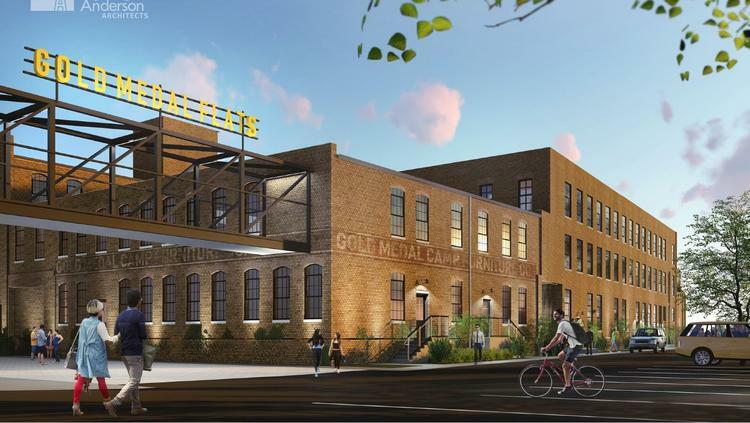 Rendering of Future Gold Medal Lofts. Project by J. Jeffers and Co. out of Milwaukee.